Daily. Some attractions are closed 25DEC, 26DEC and 01JAN. - Sydney Opera House Tour. - Taronga Zoo - Entry. - WILD LIFE Sydney Zoo. 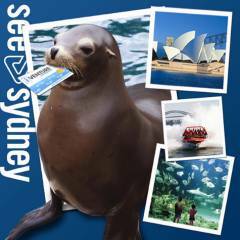 - Guidebook highlighting attractions throughout Sydney and Blue Mountains. - Please note some attractions may not be available on Christmas Day, Boxing Day and New Years Day, weekends, NSW School Holidays and Public Holidays. Please contact us for more information. An iVenture Card is the easy way to visit your holiday destination. For a single price, it offers you free entry to the top attractions. The credit card sized card comes with a guide that highlights everything you'll want to see and do, with useful maps and local tips to help you on your way. - Explore the best of what Sydney has to offer. - Your choice of entry to 5 top attractions in and around Sydney. - 5 tickets valid for single entry. - 35 attractions to choose from. - Valid for 3 months. - Save up to 40% on admission fees with an adult pack. Infant: 0-3 years inclusive - free of charge (Some attractions may charge for an Infant under 4 years). Adult: 16 years and over - adult rates apply. - Card will be activated from the first time it is used and will then only be valid for 3 months from the time of Card Activation. If any chosen activities need to be booked, card must be valid at the time of booking and visit. If pre booking any attraction, card will be activated at time of booking so it is important to make sure card is still valid for the day of visit. - Card is to be presented at pre paid ticket window or admission point at each attraction. - Some attractions may not be available on Christmas Day, Boxing Day or New Years Day. - A $20 supplement is payable to the operator on weekends, NSW School Holidays and Public Holidays for some attractions. Please contact us for more details..